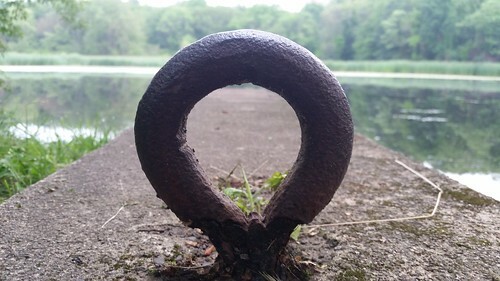 A metal hoop in cement near Ferncroft Pond. Upon a walk this morning, I decided to stop by Ferncroft Pond. I occasionally visit this small little nestled and rarely visited nook that's off of Ferncroft Road, down the street from North Shore Community College. It was a calm and slightly hazy morning and there was a nature-induced soundscape of birds, a slight breeze, insects chirping and even the occasional bullfrog letting one loose. I thought about snapping a photo of the pond, but then I spotted this figure in the ground and thought it could make a more powerful centerpiece to the photo. I liked how it came out overall, though if I were to take it again, I would try to have some of the water seen within middle part as this would make for an interesting balance and visual. It still turned out well.